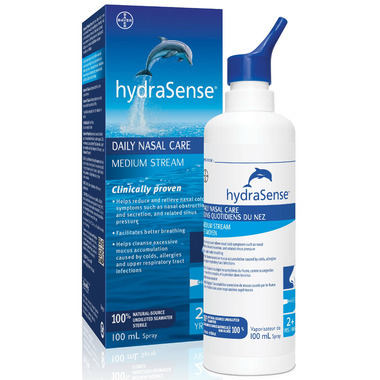 hydraSense Medium Stream Daily Nasal Care works by flushing out excessive mucus accumulation, relieving congestion caused by colds, allergies, dust, environmental pollutants or upper respiratory tract infections to help you breathe better. Choose to be flu-free! Find ways to take precautionary measures with this exhaustive list of cold and flu prevention tips on our blog, The Well. Safe for long-term use without rebound effects when used as directed. 100% natural-source, sterile, undiluted, isotonic, desalinated seawater, equivalent to 9 g/L (0.9%) NaCl and a combination of more than 70 marine trace elements. Non-medicated, preservative and additive free. The container uses no propellant gas. Gently apply hydraSense Medium Stream Daily Nasal Care at least twice a day (morning and evening), and 4 to 6 times a day when cold or allergy symptoms are present.